Nigel Baxter once again showed his class on commercial waters topping the all-winners final at Float Fish Farm Fishery on the Two Island Pool with 112lb 5oz from peg 29. Runner-up on this lake was Lee Marlow. who caught 92lb 6oz from peg 34. Over on the Horseshoe Pool another of the area’s top rods, Jay Richardson, topped a strong field. He took a comfortable victory with 95lb 7oz from peg 20. Roy Wells on peg one came second with 69lb 4oz. 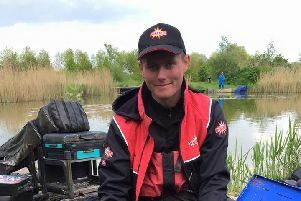 Castaways AC were back at Biggin Lake for more silver fish action and with the venue in great form expectations were high. And nobody was disappointed. Most had good nets of skimmers, crucians and roach topped by Paul Dotchin with a fine 34lb 2oz net all taken on the pole with pellet from the wood side section peg 44. In second place from peg 41 was Mel Saggers, who caught skimmers and a bonus bream for 19lb 8oz. Third was Alan Jopling with 14lb 4oz caught on sweetcorn. The latest Tuesday Club match was fished on the small lake in the Ramsey Gold Club complex. First place went to Mike Smith fishing the pole with pinkie over groundbait catching small roach and skimmers for 8lb 9oz. Second was Roger Biddle, who caught 7lb 10oz on maggot, and third was Alan Jopling with 6lb 4oz. The fourth Buttonhole qualifying round on Saturday saw last year’s winner Steve Poole safely through to this year’s big final after taking top spot from peg 20 with 120lb 7oz. He drew well and started the match across to the island but was not finding many fish willing to feed. He had better luck though coming in a little shorter fishing pellet shallow. Second with 100lb 14oz was Andy Rose, who fished a variety of methods to keep the fish coming all day. In third place with 87lb 14oz was Stephen English.